Laurel and Hardy had every right to be apprehensive about the talkies. After all, in 1929, sound films were still considered a bit of a novelty by many, and the new technology had hastened the demise of many a silent actor's career. The Roach Studio was outfitted for sound in January of that year, even though Roach played it safe and planned a shooting schedule for the coming year which was comprised of an equal mix of sound and silent films. By the end of the year, however, it was obvious to all that sound was here to stay. The limitations initially imposed by the new technology were quickly ironed out, and even those who had fought sound's hasty encroachment now resigned themselves to making the new medium work for them. Stan and Babe needn't have worried, as their voices matched their personalities -- beautifully, hilariously so. 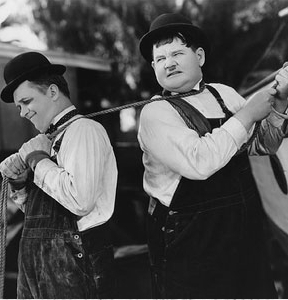 Wonderful as their silents were, it took sound for Laurel and Hardy to realize their comic potential. True, many of their sound shorts were sparse on dialogue, heavy on visual gags. But even these films could boast an extra dozen or so laughs over their silent counterparts thanks to the occasional "Ooooooooh!! ", "Doh!" or "What happened? "; not to mention the frequent banging, clanging, crashing and splashing that adorned their soundtracks.